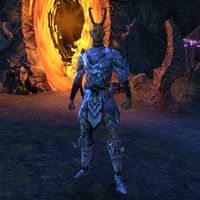 Herne Ghorev is a Herne found in a small pocket of Oblivion called Dyzera Realm, accessible from Cold-Blood Cavern during the related quest. The enemy slashes at the target twice, dealing moderate physical damage over time and healing itself over time. The enemy winds up a spell that stuns the target briefly, dealing moderate magical damage over time. This attack can be interrupted, and the stun can be broken free from. The enemy summons two Skaafin Witchling to attack the target. They should be killed quickly to simplify the fight. Technically, Herne Ghorev is just a renamed Skaafin. This page was last modified on 7 August 2018, at 01:47.